This is a large beautiful log and brick home in the Prescott National Forest. We have recently renovated the home with concrete countertops, refinished cabinets, replaced flooring, added 2 new flat screen televisions, new furnishings and freshened up the paint. You will love this cabin and there is no BETTER VALUE for a cabin rental. Invite your friends and additional families!! 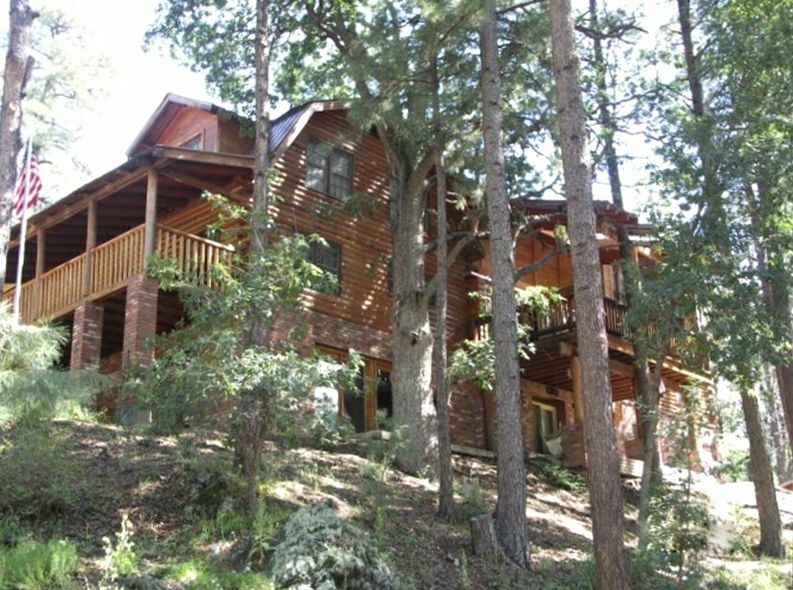 this is a big place.The cabin is located less than 8 miles from downtown Prescott, AZ. The 5400+ sq feet of living area lends itself well to large groups and multiple families. The cabin is located in the Prescott National Forest and there is 2.5 miles of dirt road to access the cabin. We recommend four wheel drive and possibly chains during the winter months in case of snow and ice. This cabin is cozy and very beautiful. There are 2 master suites with full baths and 2 additional bedrooms. The bunkroom sleeps 6 on bunk beds with lower futon mattresses that are great for kids or a family who has multiple young children that want to sleep in the same room. There is also an additional bedroom with a queen bed. The large living areas include large couches and lots of floor space for additional sleeping. The property is on 4 secluded acres.This is a fantastic place to be enjoyed for family getaways, reunions or corporate functions. We are confident you will enjoy your stay and return often. The game room is complete with a bar room shuffle board game, pool table, air hockey, poker table, dry erase board and many games and puzzles. The outside includes horseshoes and a large fire pit as well as several playthings. There is nowhere better for mountain biking, hiking, trail riding or watching deer and wild turkey. Downtown Prescott shopping, eating and whiskey row is all less than 10 miles away. There are hiking, horseback, ATV and bike trails throughout the mountain. They take you thru beautiful terrain that goes on for miles and miles. You will also enjoy hiking or riding to the lookout tower at the elevation of 8000 feet. Quad and ATV riding trails and roads lead all over Prescott, we Often take trips to lynx lake for breakfast or ride to crown king for lunch and fun. We have taken our quads from lake pleasant all the way to our cabin thru crown king, the trip is about 6 hours of riding and explores beautiful country. Goldwater lake is about 4 miles from our cabin and has fishing, Volleyball courts and a picnic area. Other lakes are also in the area. We love our cabin and enjoy the time with friends and family. My wife Connie, and my 4 daughters spend as much time at the cabin as our schedules allow. The girls have become very busy with dance, school, cheer and other activities that come with teenage years. We decided in 2008 that we would begin to rent the cabin for others to enjoy. We can now justify having a million dollar cabin as a 2nd home. Thanks to all that have become regular renters. This location is only minutes from Prescott but at an elevation above 7000 feet. We can enjoy the festivals, shopping, rodeos and everything else Prescott has to offer while being in a cool pinetree setting that is off the beaten path. The property is 4 acres but there are very few neighbours and the home is very private. HBO and many sports channels. (2) This home features 4 Seperate patios. Very clean, very spacious, nice layout. Perfect for big groups. We loved our stay. Twelve of us went for the weekend and had an amazing time. So much space and comfort. A couple of bugs downstairs but that's to be expected in the woods setting, nothing major. Would consider this cabin again without a doubt. This was cabin was beautiful! My volleyball team and parents were very impressed with this house until we all started to look closer. There were many broken windows, the down stairs bed was broken and being held up with wood blocks, the parents who stayed in the room were very nervous to even move around a little. The refrigerator did not keep our food/milk cold and the oven took over an hour to heat up. The upstairs bathroom did not have warm water and the "jetted tub" wasn't so jetted. Other than that my girls loved staying here with the game room, scenery, lots of room! Thank you John for letting us stay in your home! Still a wonderful vacation home! As always, this log cabin is the best when it comes to get-aways. We enjoy the fact it can hold our large family comfortably and is in a prime location for beautiful mountain scenery. We can't wait for our next trip. Thanks again John Bigelow! We really enjoyed our stay at this beautiful and enormous cabin! The kids kept busy with so much to do and the land surrounding the cabin was beautiful. We are looking forward to booking again soon! Amazing property.! Perfect for our Family Holiday vacation. The cabin was perfect for our family. Plenty of room for everyone but we spent the majority of time in the giant living room in front of the fire or in the spacious kitchen at the table making food, laughing and creating memories. The amenities were perfect, house was clean, lots of amazing views from every window and very cozy. Thank you for sharing your beautiful home with us. We can’t wait to come back again someday! 8 miles from the center of Prescott. All Holiday rentals require a 3 night minimum at $650 per night.